The central region, Ecuador Andes is full of life and beauty. As you travel the winding roads through the highlands you find large cities in the valleys surrounded by quilted farmland going up the sides of the mountains. Many indigenous people can be seen selling their goods in the markets or working hard in the fields. The snow capped peaks that stick high above everything else are quite a sight. To me, the peaks of my home in Colorado were impressive, but these surpass those by 5,000+ feet. Active volcanoes, with smoke rising from them are seen in this region. As well as the inactive ones, which are just as impressive. 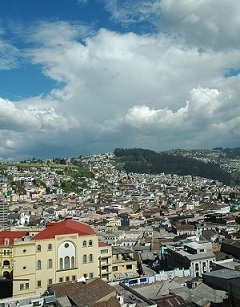 The large cities, such as Quito and Cuenca, are a pleasant mix of old colonial buildings and modern high rises. The people come from extreme backgrounds. The super poor and the super rich come together in the many parks and squares. 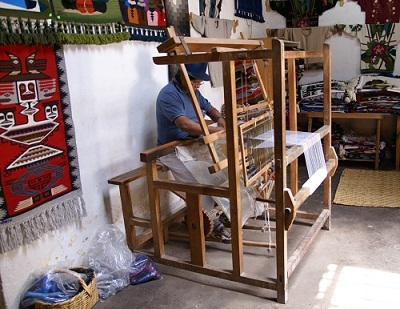 The southern Ecuador Andes boast the beautiful towns of Loja and Vilcabamba. These relaxed mountain towns are known for good food and music. A nice stop over between the central and southern Andes is Alausi, where you can ride the famous Devil's Nose train. This track was a feat of engineering by the Ecuadorian people and others who worked on the project. 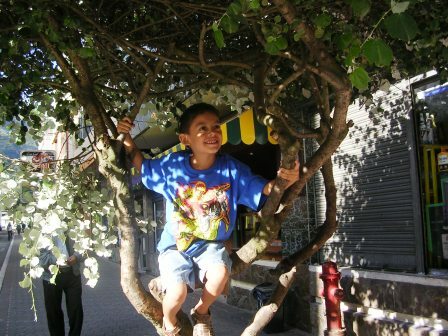 Mindo, just west of Quito, has also become popular with eco-tourists, because of the bird-filled cloud forest. The food of the region is very distinct. Delicacies like cuy (guinea pig) and tripe may turn your stomach, but the locals love them. Many other dishes, with corn from the area as the main ingredient are also popular. The volcanic soil found in many parts produce an abundance of fruits, vegetables and flowers, which has made the city of Ambato famous. 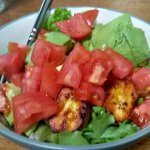 To learn about some interesting foods to try in Ecuador, see our Food Guide. 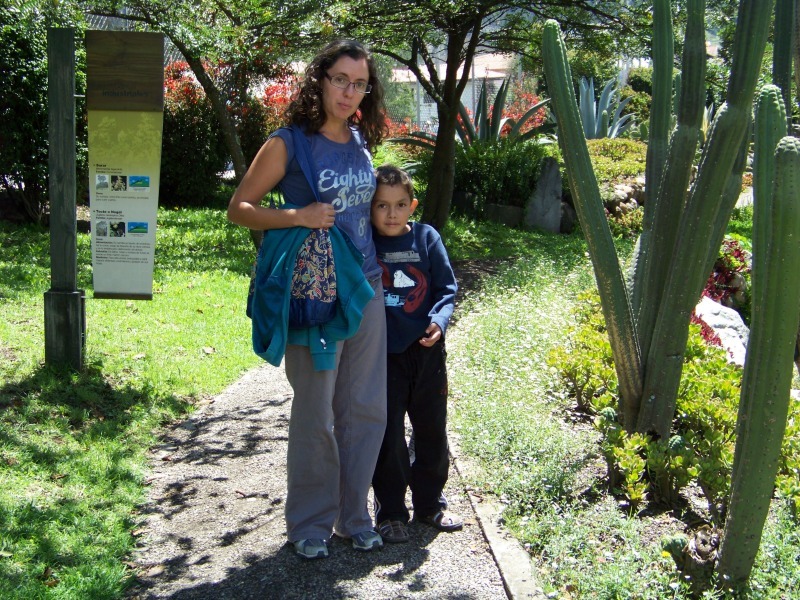 When we first arrived in Ecuador we moved to the Ecuador Andes province of Bolívar (~9000 ft). We found the people to be reserved, but friendly. Everyone walked through town arm in arm. At first we thought they we're just trying to keep warm, but really the closeness is just part of their culture. We arrived during the North American winter, so the mild air of the mountains felt warm to us. Soon though our bodies adjusted to the climate and we realized why everyone wears sweaters. We often got to "walk in the clouds," as dense fog would settle into the valley. We got a good workout here too. Not only was the elevation high, but the streets were steep. Sometimes it felt as if you we're walking straight up; and going down was just as hard. One set of steps was the equivalent of maybe eight flights of stairs, but it was all one straight shot UP. We called them "the stairs of death." My dad's memory from this area was the handiwork of the neighboring towns. One town, Chimbo, made fire works, while another made small hand guns. There was lots of gunpowder in the air. We're just glad these towns haven't blown up yet. Most of the photos I took from our first home in Ecuador were of the beautiful sunsets that surrounded the quilt pattern on hillsides in the evening.